As a bonus, the collection also contains an allegorical playlet set in the celestial world of mythology. In a polyglot country such as India, where so many primary languages and their innumerable offshoots abound, literature in the vernacular has often been restricted to those few who understand their mother tongue and are literate enough to enjoy the reading process. Over the decades, to the many who have grown up under the benign influence of the English language, only an exceptional few writers have had the education and been exposed to the subtle beauty of our own indigenous languages. Outstanding authors like R.K. Narayan, who wrote feelingly, eloquently and simply of ‘days gone by’ in an almost pastoral India, originally in English, are few and far between. Those versed only in English, desirous of wishing to learn about the unique styles and mores of traditional India, but lacked access due to their deficiency in the local language, have had to depend on translations of novels and books by enlightened writers fluent in both languages. To those even less literate, sitting at the feet of their grandparents and being awed by tales told in the time-honoured verbal tradition, was the only source of enlightenment. 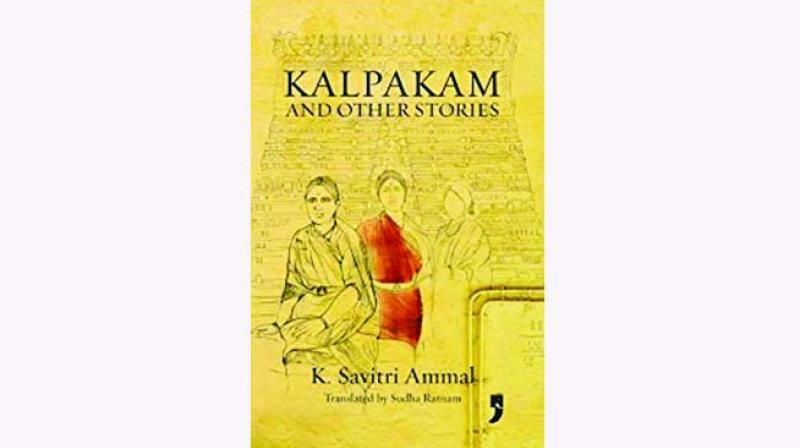 It is under these challenging circumstances that one commends a new book in English, just released, of Tamil short stories titled Kalpakam and other stories, by K. Savitri Ammal, sensitively translated by her grand-niece, Sudha Ratnam. The slim volume is a pot pourri of short stories, dealing almost entirely with the joys, sorrows, trials and tribulations of typical middle class families during the early 20th century India. As a bonus, the collection also contains an allegorical playlet set in the celestial world of mythology. However, when you get right down to it, it is the simple tales of the eponymous Kalpakam, Sarasu, Thangam, Digambaran, Chellam, Ramabhadran, Maragatham and others who people the book, their unique moments of conflict resolution and serendipity that gives the tome its archaic charm. Relationships, portrayed seemingly simplistically, for that very reason gain a level of gravitas and involve the reader in ways one is normally unaccustomed to. As one scans the dust jacket of the book and goes through the translator’s introduction, it becomes more than apparent that the redoubtable Savitri Ammal was more than a woman of substance. A lady of strong character and great insight, she more than held her own in what many may now regard as a hidebound society, inextricably tied to their customs and rituals, largely oblivious to what happened in the outside world, unable to see the wood for the trees. However, Savitri Ammal was a notable exception to the rule. While respectful of her milieu and its time-honoured traditions, she was a free-thinking spirit who did not hesitate to call a spade a spade. Without giving away too much of the book, suffice it to say that Savitri Ammal withstood more than her fair share of misfortune with a stoicism that became her, but found a creative outlet to release her from what might otherwise have become a drudge of an existence. Translations of books into other languages can often be tricky with many unseen pitfalls in the form of idiomatic transgressions, unintended double entendre, puns where none was intended and so on. Oftentimes, translations are reduced to mere word-for-word transliterations, and it takes a skilled practitioner to go beyond the original language and find expressions to suit the English language. In the case of Kalpakam and other stories, the translator has clearly shown great respect for Savitri Ammal, tip-toeing with great care over egg shells to ensure no obvious cracks appear. Dorothy L. Sayers, one of the finest mystery thriller writers of all time (creator of the aristocratic sleuth, Lord Peter Wimsey), was even more celebrated for her brilliant translations of Dante Alighieri’s Divine Comedy, which were hailed by literary experts as ‘at once a declaration of love and a statement of method.’ Not that one is even remotely making comparisons here, but it would appear that Sudha Ratnam’s heart was in the right place as she set out to render in an alien tongue, her grand aunt Savitri Ammal’s every day Tamil stories of domestic complexities from a bygone era.